Making The Most of Naptime : Even I can make an apron! Last year I discovered fabric.com. I wish it was a Canadian site so I didn't have to pay astronomical shipping costs. The huge selection on the site far outweighs the downside of the high shipping costs, so I still sneak the odd package into our house now and then. I also try to bundle more into an order to make the most of the shipping, but it seems to be a completely unpredictable amount each time....some combination of weight, volume, plus a random dollar value tacked on for dummy tax for someone like me that is willing to pay it. Anyone knows that bringing children to a fabric store, unless they are sedated, is not a good idea. (For the record, I don't sedate my children. I just assume it would make it very convenient to do things such as peruse a fabric store at my leisure.) There are thousands of bolts of fabric to look through, and the aisles are always tight. I've tried it with my kids, and I usually have about 5 minutes from the time I enter the store before there is the potential for an unruly meltdown. That is simply not enough time to squeeze my stroller (which feels like it's the size of a Greyhound Bus or motorhome) into the tight aisles, while frantically finding about 1% of the list I came there for. 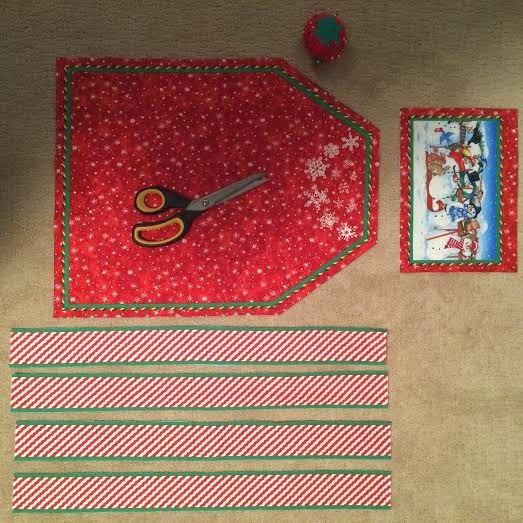 I would need at least another ten minutes to allocate to waiting in line at the cutting table for the blue-haired woman with a walker in front of me to debate how many metres of quilt batting she needs for her Christmas potholders. So, online fabric buying is the way to go. You look for what you need during naptime. Or at 5am from the comfort of your bed, while in your jammies, wondering if your baby went back to sleep after a brief 4:45 wailing session. Trust me, if you don't go back to sleep, they do. It's weird how that works. Anyway..... fabric. Online. Best option. This year, during one of my early morning Iphone shopping trips, I found something that a beginner seamstress could tackle. 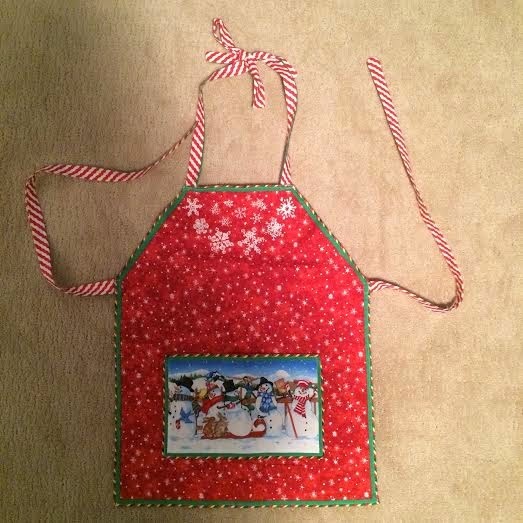 A toddler apron. Since I don't even really know how to read a pattern (I'm kind of a wing-it type of crafter), what I found was perfect. It was a pattern, printed on fabric, with really simple directions. 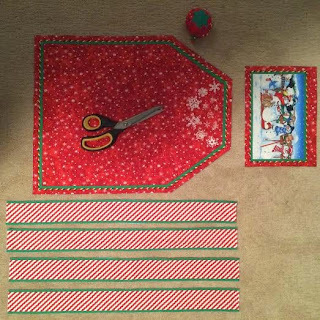 You just cut it out and sew away. So yesterday I made two of these! They might look slightly like a kindergartner made them if you look closely, but I'm proud of them! Two Christmas gifts checked off my list now :) All for the low price of $4.49 each. Plus shipping. Which I won't elaborate on.